While Bob La Follette’s exploits as leader of progressive politics are legendary, his early morning exertions to save valuable government documents and executive department paintings during the disastrous 1904 capitol fire are largely unknown – until now. 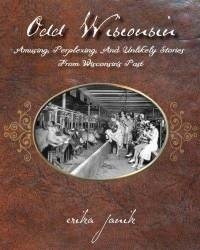 Odd Wisconsin captures the Wisconsin people, places, and events that didn’t make it into conventional state histories, lowering a bucket into the depths of Wisconsin history and bringing to light curious fragments of forgotten lives. This unique book unearths the stories that got lost to history even though they may have made local headlines at the time. No mythical hodags or eight-legged horses here! Odd Wisconsin features strange but true stories from Wisconsin’s past, every one of which was documented (albeit by the standards of the day). These brief glimpses into Wisconsin’s past will surprise, perplex, astonish, and otherwise connect readers with the state’s fascinating history. From “the voyageur with a hole in his side” to “pigs beneath the legislature,” Odd Wisconsin gathers 300 years of curiosities, all under the radar of traditional stories.